Just a quick good video this time. Static stretching is the most practiced stretching method. Because its purpose is to maintain the body in good physical form, static stretching is more appropriate for beginners and people who are not very active. Static stretching relies on basic stretch-ing movements and muscle contractions. These exercises, performed slowly over time, help you discover your deep (postur-al) muscles. They allow you to work your entire body while increasing awareness of your flexibility. Muscles are lengthened using bending, extending, or twisting positions. These stretches must be done slowly so that the antagonistic muscles are not stimulated. Once you are comfortable in a stretched position, you hold the position for about 15 to 20 seconds to relax, lengthen, and oxygenate the muscle fibers. Dynamic stretching is often recommended in athletic training programs. It increases energy and power because it acts on the elasticity of muscles and tendons. It relies on swinging movements done with a certain amount of speed. The technique consists of swinging the legs or arms in a specific direction in a controlled manner without bouncing or jerky movements. The agonist muscle contracts rapidly, which lengthens the antagonist muscle, thereby stretching it. Gradually stretch a muscle to its maximum. Perform an isometric contraction for about 15 to 20 seconds (while still in the lengthened position). Relax the muscle for about 5 seconds. Restretch that same muscle for about 30 seconds. This is from the author of Delavier’s Stretching Anatomy. 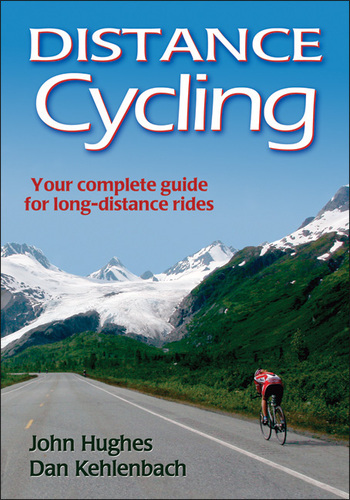 It’s published with permission of Human Kinetics. Athletes spend hours training to hone their skills, but few consider stretching a vital component to their athletic performance. 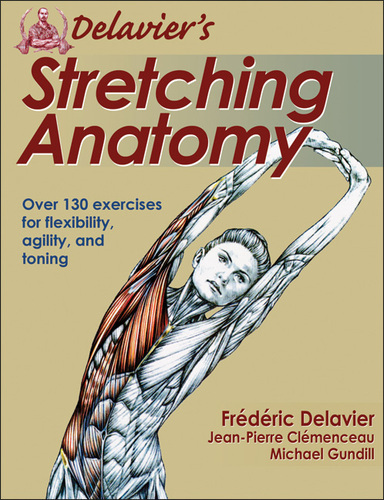 According to popular author Frédéric Delavier, stretching has the ability to increase performance levels and should be included in every athlete’s training regimen. In his upcoming book, Delavier’s Stretching Anatomy (Human Kinetics, October 2011), Delavier discusses the top five reasons every athlete should stretch. Maintain or increase range of motion. Repetitive athletic movements can reduce range of motion by tightening the muscles and tendons. “A certain tension is required, especially in strength sports, but too much tension and a decreased range of motion can ultimately lead to injury and reduced performance,” Delavier explains. “Stretching regularly can prevent this problem.” In certain fields, like swimming or gymnastics, stretching must be done regularly to increase the range of motion in a joint when that range is synonymous with increased performance. Warm up before working out. Stretching warms up the muscles, tendons, and joints, which prepares the body for physical exertion. Relieve stress. “Thanks to its euphoric oxygenating effects, stretching minimizes stress that can paralyze muscles, which is especially beneficial before a competition,” Delavier says. Although flexibility is important for an athlete, Delavier advises finding a balance between muscle tension and flexibility. The muscle must be flexible enough to have a slightly greater range of motion to prevent injuries and aid movement, but not so flexible as to diminish performance by becoming like a rag doll whose joints move around easily. “Stretching has the ability to increase or diminish performance levels,” Delavier adds. “So we must be careful to use stretching properly.” Delavier’s Stretching Anatomy offers stretches for releasing tension, increasing flexibility, and creating an overall sense of well-being. This is an excerpt from Nutrient Timing for Peak Performance. It’s published with permission of Human Kinetics. What Are the Benefits of Nutrient Timing? When sports nutritionists talk about energy, we are referring to the potential energy food contains. Calories are potential energy to be used by muscles, tissues, and organs to fuel the task at hand. Much of the food we eat is not burned immediately for energy the minute it’s consumed. Rather, our bodies digest, absorb, and prepare it so that it can give us the kind of energy we need, when we need it. We transform this potential energy differently for different tasks. How we convert potential energy into usable energy is based on what needs to get done and how well prepared our bodies are; how we fuel endurance work is different from how we fuel a short, intense run. It is helpful to understand that you must get the food off your plate and into the right places in your body at the right time. Clients consistently ask us, “What can I eat to give me energy?” For you, “energy” may have different meanings, depending on what you’re referring to and how you’re feeling. If you’re talking about vitality, liveliness, get-up-and-go, then a number of things effect this: amount of sleep, hydration, medical conditions, medications, attitude, type of foods eaten, conditioning and appropriate rest days, and timing of meals and snacks. Food will help a lack of energy only if the problem is food related. You may think that’s obvious, but it’s not to some. If you’re tired because you haven’t slept enough, for instance, eating isn’t going to give you energy. However, if your lack of energy is because you’ve eaten too little, your foods don’t have “staying power,” you go for too long without eating, or you don’t time your meals and snacks ideally around practice or conditioning, then being strategic with food intake can help you feel more energetic. What, how much, and when you eat will affect your energy. Nutrient timing combined with appropriate training maximizes the availability of the energy source you need to get the job done, helps ensure that you have fuel ready and available when you need it, and improves your energy-burning systems. You may believe that just eating when you are hungry is enough, and in some cases this may be true. But, many times, demands on time interfere with fueling or refueling, and it takes conscious thought and action to make it happen. Additionally, appetites are thrown off by training, so you may not be hungry right after practice, but by not eating, you are starving while sitting at your desk in class or at work. Many athletes just don’t know when and what to eat to optimize their energy stores. By creating and following your own Nutrition Blueprint and incorporating the NTP, your energy and hunger will be more manageable and consistent, whether you are training several times a week, daily, participating in two-a-days, or are in the midst of the competitive season. During the minutes and hours after exercise, your muscles are recovering from the work you just performed. The energy used and damage that occurred during exercise needs to be restored and repaired so that you are able to function at a high level at your next workout. Some of this damage is actually necessary to signal repair and growth, and it is this repair and growth that results in gained strength. However, some of the damage is purely negative and needs to be minimized or it will eventually impair health and performance. Providing the right nutrients, in the right amounts, at the right time can minimize this damage and restore energy in time for the next training session or competition. 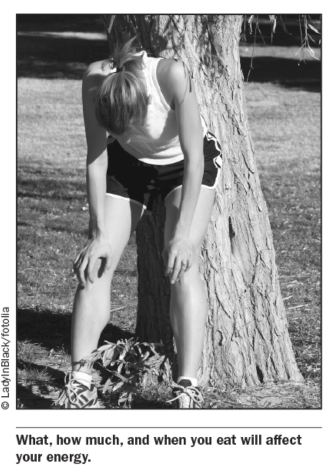 The enzymes and hormones that help move nutrients into your muscles are most active right after exercise. Providing the appropriate nutrients at this crucial time helps to start the repair process. However, this is only one of the crucial times to help repair. Because of limitations in digestion, some nutrients, such as protein, need to be taken over time rather than only right after training, so ingesting protein throughout the day at regular intervals is a much better strategy for the body than ingesting a lot at one meal. 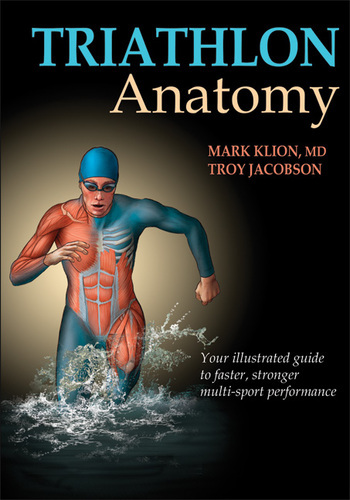 Additionally, stored carbohydrate energy (glycogen and glucose) and lost fluids may take time to replace. By replacing fuel that was burned and providing nutrients to muscle tissue, you can ensure that your body will repair muscle fibers and restore your energy reserves. If you train hard on a daily basis or train more than once a day, good recovery nutrition is absolutely vital so that your muscles are well stocked with energy. Most people think of recovery as the time right after exercise, which is partially correct, but how much you take in at subsequent intervals over 24 hours will ultimately determine your body’s readiness to train or compete again.